Assignments are made based on hospital needs. How do I become a volunteer for Piedmont Newnan Hospital? Applicants are required to submit to a criminal background check and drug screen before becoming a volunteer. Upon acceptance, new volunteers will attend a hospital orientation prior to being trained in their positions. 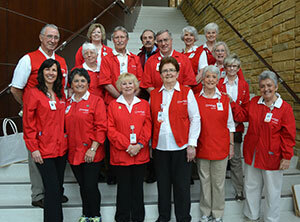 Volunteers play a very important role at Piedmont Newnan Hospital. These 100+ men and women are all ages and come from all walks of life. They run the gift shop, transport patients, assist with admissions and discharges, answer phones, staff the information desk and complete special projects and fundraisers for the hospital. Download the Auxiliary Membership Application. For more information call 770-400-2380 or e-mail us at PNH.Auxiliary@piedmont.org.